Manufactured by Coats GmBH, each kit includes aida fabric, all necessary threads (Anchor stranded cottons) on a thread organiser card, a needle and full instructions. 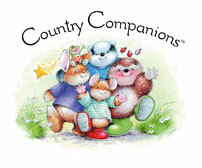 Anchor Country Companions CTM0006 - New Baby counted cross stitch kit. Finished size 25.5cm / 10" H x 20cm / 7¼" W on 16 count cream aida, includes an alphabet for personalisation. This kit has two colour options (pictured), one for a boy and one for a girl, with enough threads to stitch one of the designs.